If you’re a makeup junkie like I am, (sandwiched between pilates & facials in my monthly “self-maintenance” expenses) there’s nothing that a trip to Sephora can’t at least temporarily fix. In my insecure moments, (like on a dance floor when I look & feel uncoordinated) reapplying the perfect shade of bold lipstick gives me the shot of confidence I need. When I have slept poorly due to neuropathy pain (or from worrying about my kids getting hurt & 101 other things I can’t control), a quick dab of under-eye concealer (and 3 cups of strong coffee) helps me to look awake and feel somewhat human. Makeup can be transformative both physically and emotionally. A simple swipe of bronzer has the power to not only bring color to pale cheeks, it can also reflect & radiate positive energy, bringing warmth to our lives. But for many of us living with hand grip issues, tremors, and neuropathy due to conditions like MS, CMT, Arthritis, & Parkinson’s (to name a few), finding tools and makeup products that we can use (without looking like a 3 year old did our makeup), can be a challenge. If you have fine motor deficits, you will likely relate to my Post, How To Get A Grip When You Literally Can’t. Grace Beauty a new brand scheduled to launch soon. 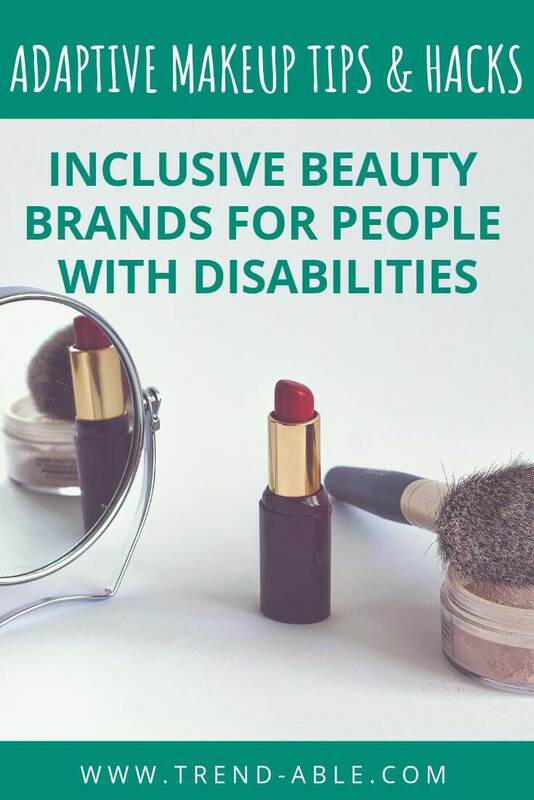 Designed specifically for beauty lovers with disabilities, Grace has created a line of makeup tube & bottle attachments to help people with fine motor challenges achieve better grip and control of their makeup products. Grace’s first product line focuses on mascara attachments. They will offer three different styles of attachments; The Ring Grip, best suited for people who have an extremely weak grip, the Safe Grip, designed for better control, and the Square Grip, which attaches to both sides of your mascara tube, making it easier to open and hold! Please note that I have not personally seen or tested Grace Beauty’s products myself (not for lack of trying) and cannot completely recommend. But, the concept is awesome! Fortunately, although my hands aren’t great (I have a progressive neuromuscular disease called CMT), I am able to apply mascara without needing special attachments. I have found that the shape of both the mascara brush and the casing can make all the difference. I’m currently loving Benefit’s (full size) BadGal Bang Mascara with it’s textured ridges & amazing brush, as it provides awesome grip and when used in combination with my Easy DIY mascara shield hack. I get killer lashes without the typical smudges all over my face & clothes. If holding small objects is not in your wheelhouse of skills, then pump bottles of any kind should be in your toolbox of “things that make life easier”. From foundations to skincare products, pump style bottles are the way to go. Instead of twisting or gripping, the subtle movement of pushing down on a lid can easily dispense your favorite product. Most liquid makeup or skincare products can be depotted (removed from its original container and transferred to something more practical) and placed in a pump style bottle to make them accessible . Does your attempt at a smokey eye or winged eyeliner leave you looking like you just left the football field or boxing ring? Or, maybe your fine motor challenges have prevented you from experimenting with eye makeup all together? If this is the case, you may want to try one of Lancolm’s extra long eyeliners . They come in a ton of different fun colors like mossy green, dusty purple, and signature black, so you can play up your eyes with a bold pop of color or stay classic and neutral with black. They do need to be sharpened. Although they say not to use regular electric sharpener on eye pencils (they are soft and can get destroyed), I used mine with this pencil and it was fine. I also use these easier to grasp and twist dual sided sharpeners that I found on Amazon. If hand tremors have been holding you back from trying the winged eyeliner look, there’s another cool product that’s helping people with disabilities do their makeup. The Vamp Stamp was founded by celebrity makeup artist and co-founder of the Beauty Blender, Veronica Lorenz. Veronica herself experienced fine motor deficits after she was diagnosed with a benign spinal cord tumor in 2013 . Veronica created The Vamp Stamp to help make putting on makeup easier for others with disabilities. So I went to my local Ulta to test the Vava Voom Winged Vamp Stamp (that’s me in the image above) I really like the stamp part (although it could be longer) but the problem was with the eyeliner pods. If a product aims to help people with fine motor problems put on makeup, then why would they not think to use something other than eyeliner pods with tiny caps that have to be held and twisted on and off? Fortunately, Vamp Stamp does sell their stamp by itself which you can use with any eyeliner of choice. Hmmm, I have an idea. I wonder if the stamp would work as well if it was dipped into moistened eyeshadow pads instead of annoying liquid eyeliner pods? Definitely worth another trip to Ulta to experiment…don’t ya think? A good makeup brush is an essential in every woman’s life. If you struggle with neuropathy issues or arthritis, look for makeup brushes that are longer and thicker to help with comfort and grip. I use the amazing Artis makeup brushes but there are several less expensive versions. My favorite makeup tool is my long handled beauty sponge as it allows me to blend my eyeshadows and clean up mistakes, which there are typically a ton of. Speaking of mistakes, I just started using these Makeup Remover Cloths at night and love how easily they take off my makeup, even waterproof mascara. I hope this post has inspired you to grab your makeup brushes (or buy some new ones) and start your day looking and feeling great! Did you learn anything new? Do you have any makeup tips or hacks? I can’t wait to hear from you in the comments section below. Love the rubber band idea for nail polish. I’ve been using the round grippers to open up jars. Also, thanks for the long brush and sponge handle idea. Great info! There are so many things I don’t even think of , or know they exist. Thanks for your great article! My strength and coordination do not play nicely together, so putting on perfume is a challenge. I’ve learned to buy spray perfume only. I set it on the front of my vanity with the opening facing me. I then lean over and use pressure from my chin to spray the perfume. This position gives a direct hit to my upper chest area. You have listed some great tips here. I use the rubber band tip almost daily to open jars and bottles. Every home should have a drawer with some rubber bands.